I heard this myth over 30 years ago, when I attended a community education gardening class. Tucked it away. Kept it in mind. When I built my first compost bin, I astutely placed it in my back yard where it would get some late afternoon sun. I ruled out placing it deep in a back corner, where it would be less noticeable. Too shady. Heat and light from the sun don’t break down organic materials into compost. Living organisms create heat as a byproduct when they do the breaking down (eating) of the material. Give them food and air, and their population grows prodigiously. A clear plastic lid on a compost bin does more harm than good. This truth came to, uh, light, in a university paper that made reference to an online plan for building a compost bin that included a clear plastic lid on hinges. The inventor noted that the lid allows essential sunlight to enter, plus retains heat. What the lid did, upon testing, was cause the compost to retain too much moisture, slowing down the composting process, while increasing the crop of weeds germinating from seed in the top layer of organic material. One was building, in effect, a greenhouse. 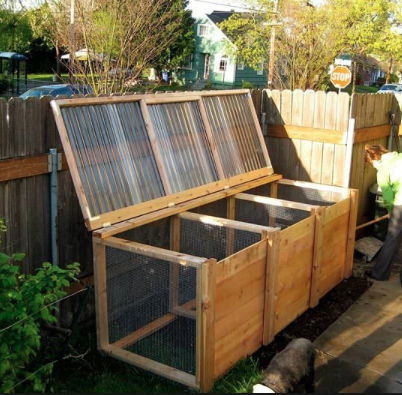 A compost bin in a shady spot will produce finished compost just as readily as one in full or part sun. A lid of any kind offers no benefit.